I was adopted by two lovely Vietnamese friends and their families today! Turns out, the hotel booked me in a “Vietnamese-only” tour of Diep Son (which I found out near the end of the day when one of my fellow adventurers asked me how I managed to be booked in a Vietnamese-only tour), so it was 18 Vietnamese people (all of whom were lovely and friendly to me) and me for the tour. 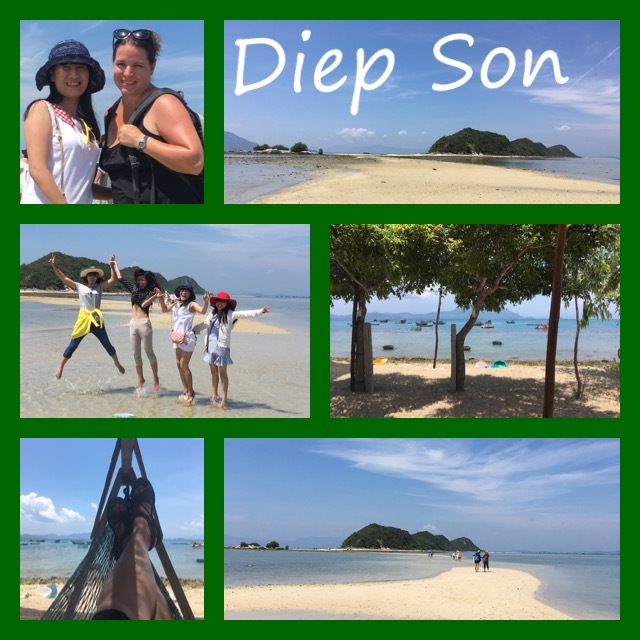 After driving an hour north of Nha Trang we took a crowded speedboat to Diep Son Island, where we wandered to the sandbar that connects Diep Son to another island (which in turn has another sandbar connecting it to another island). It was very pretty. I took selfies and pics with my new friends, and we shared information about our lives and family, and then it was time for an amazing seafood lunch! 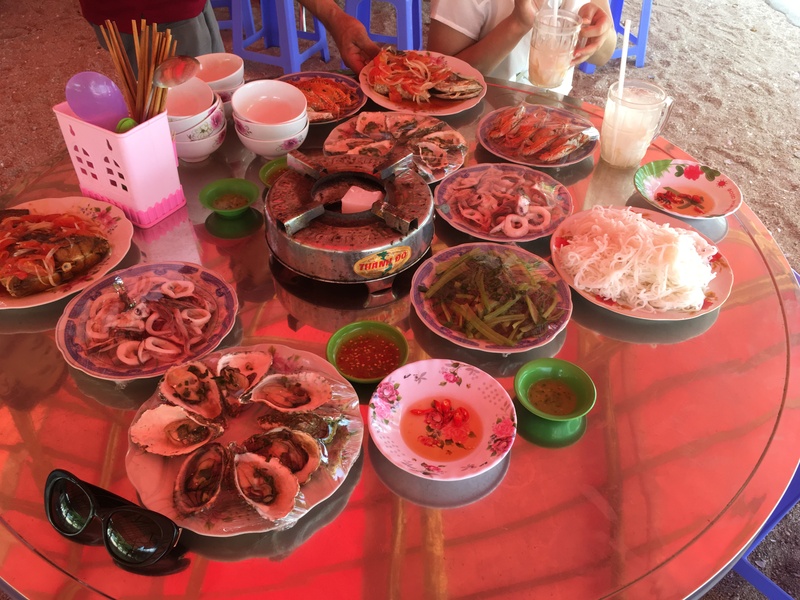 There were crabs, squid, a seafood hot pot, fish, sautéed morning glory (which I love), steamed mussels, rice, and noodles. And you just knew everything was fresh from that morning! Everyone helped me eat the things that were unfamiliar to me, showing me what was meant to be dipped in what sauce, and they all made sure I had everything. Such lovely, lovely people. After lunch, we had an hour to lounge around, and I nearly fell asleep in a hammock in front of the ocean. I could get used to this life! 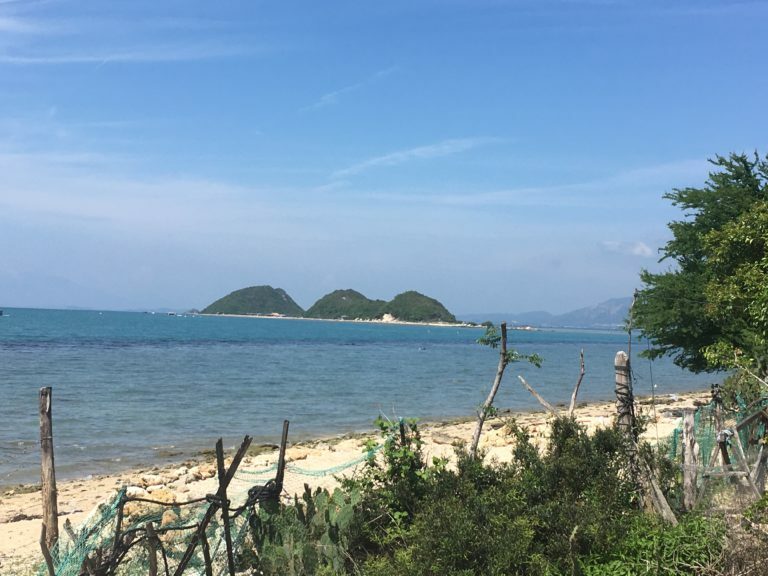 Hanging out on the beach surrounded by gorgeous mountains on three sides was pretty stupendous. And floating in the ocean and laughing with my new friends was just what the doctor ordered! 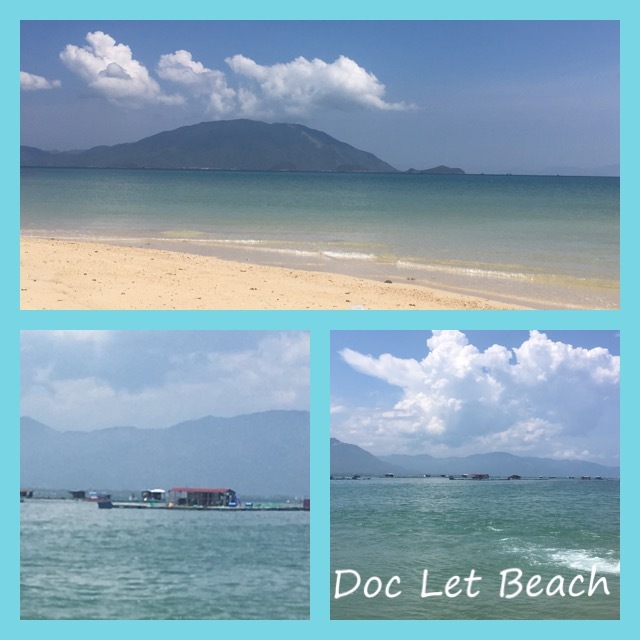 After hanging out there awhile, it was back to Nha Trang, where I had to say my good-byes and thank everyone for being so warm, welcoming, and hospitable. Another wonderful day! would love to see the hammock! did you have a Corona in your hand as well? Lol! No Corona! But that would have been fitting! In Central Vietnam it would have been Tiger Beer, though! Beers are very regional here. What the Marys said, sounds perfect and wonderful! Love that you got booked on the all Vietnamese tour. How awesome is that? I had just been saying that I wanted an immersion in Vietnamese culture, lol!